Do you love snacking but maybe want something a bit healthier than chips and dip? 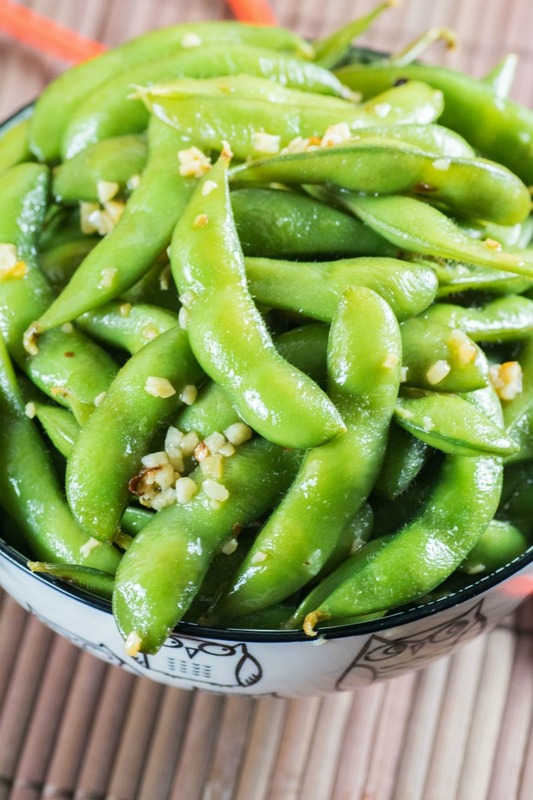 This Spicy Edamame recipe will have you loving a whole new snack! 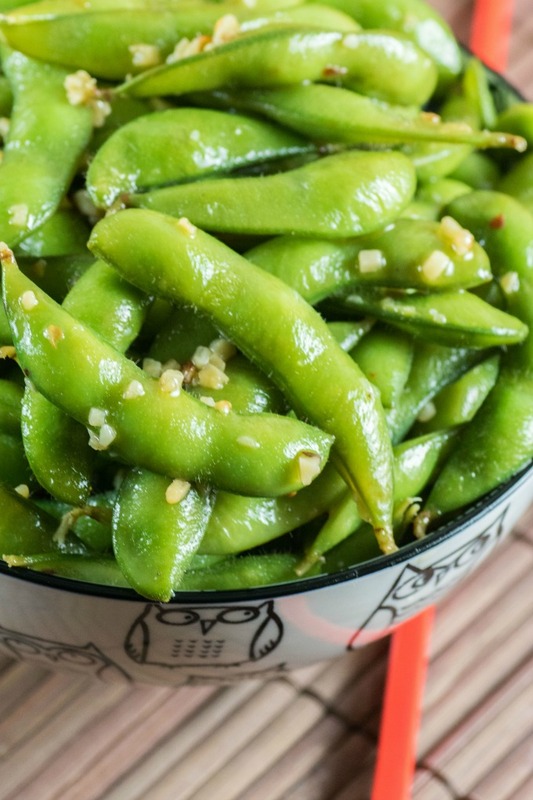 Did you know that edamame is in the freezer section of your grocery store? They are very accessible and so easy to prepare. I have now whipped up a few batches of these delicious edamame in the pods. My daughter has been the biggest fan of these growing up and edamame was the first thing she would order in a Japanese restaurant as a child. They make a great appetizer or side dish with sushi. They also are quick and easy to make, fun to eat and are a healthy snack. 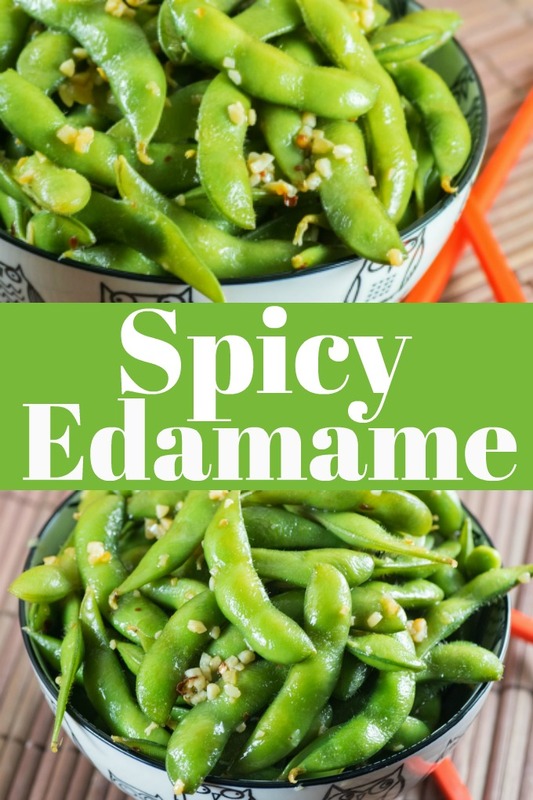 How To Make Spicy Edamame? Edamame Bowl (also good for pistachios, peanuts, cherries, nuts, fruits and candy). I have almost always had them plain after being boiled in salted water or just simply salted. 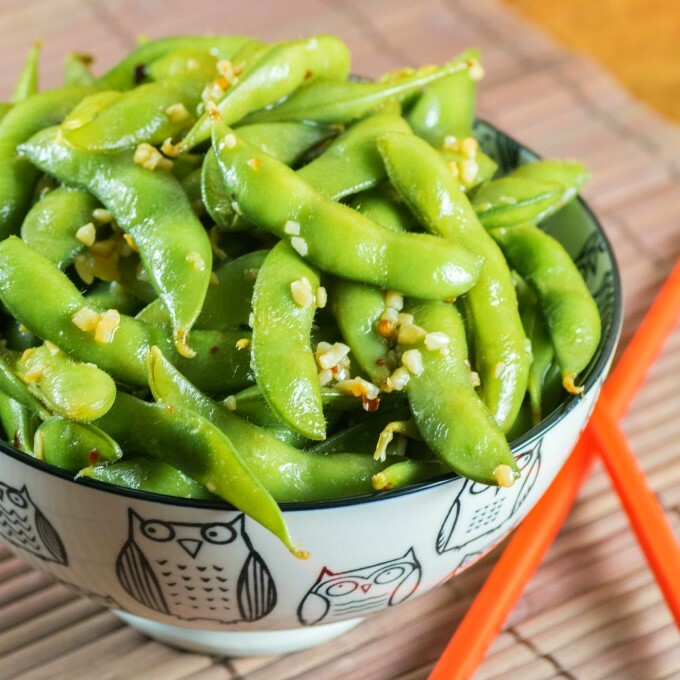 But to add garlic and red pepper flakes brings these spicy edamame to a whole new level. The method to cook them is simple. Just add them to boiling salted water and cook for about 5 min. from frozen. Immediately drain and then shock them in an ice water bath to lock in the lovely green color. If you omit this step they will still be okay but will lose their lovely green when heated again in the saucepan. Add olive oil to a large saucepan and saute up the garlic for 1-2 min. Add the red pepper flakes and the edamame. Saute them quickly to heat back up and toss to coat. Edamame are best served warm. Lightly salt with Kosher salt and a fresh squeeze of lime and serve immediately. What is edamame? Edamame is a preparation of immature soybeans and is found in a lot of cuisines of East Asia. As mentioned before the pods are boiled or steamed and served with salt. 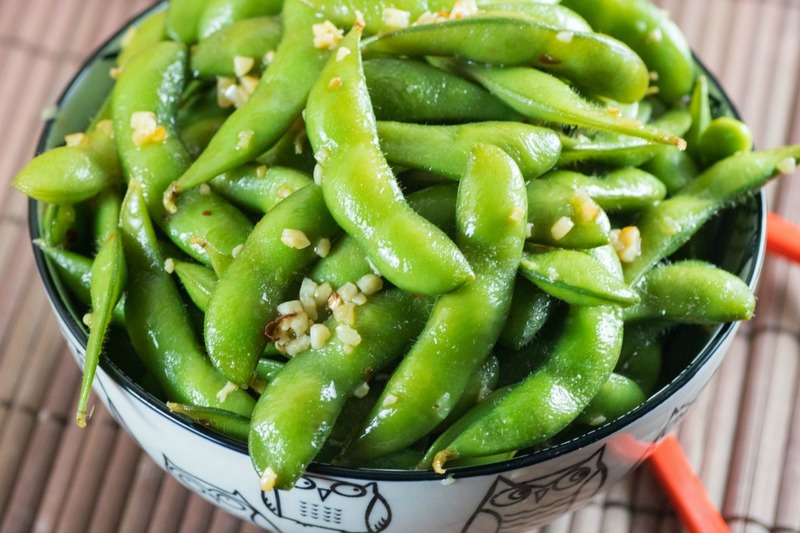 Soybeans have been used in Asian cuisine for hundreds of years and Edamame in particular dates back to 1275 as the first known mention of them. Soybeans originated in Southeast Asia and were first domesticated by Chinese farmers around 1100 BC. Where are soybeans grown? Are they just in Asian countries? This may suprise you as Canada is among the top ten countries yielding a harvest of 6 million metric tons a year according to World Atlas. Nutritional facts according to Wikipedia. 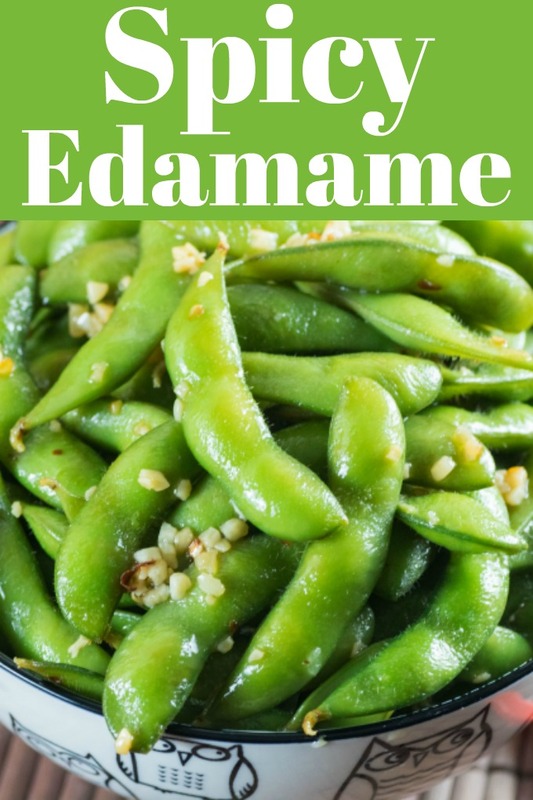 The United States Department of Agriculture states that edamame beans are a “soybean that can be eaten fresh and are best known as a snack with a nutritional punch”. Pretty interesting facts I would say. I learned something new doing my research. These edamame are perfect when they are simply made, no need for soy sauce, sriracha, sambal oelek, or sesame oil. That would over power the delicate taste of the edamame. The garlic/red chili flakes are just the right touch. So are you thinking how do I eat these? You put a section of the pod in your mouth and with your teeth slide the soy bean out of the pod. You then do that with the next one and the next one until the pod is empty. The pod is then discarded and move onto the next one. 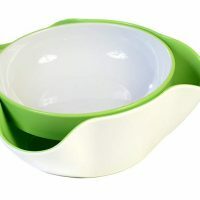 The bowls from Amazon that I showed you above are perfect to serve a dish like this in as the top houses the edamame and the bottom allows you to throw away the shell. Very cool and ingenious idea. 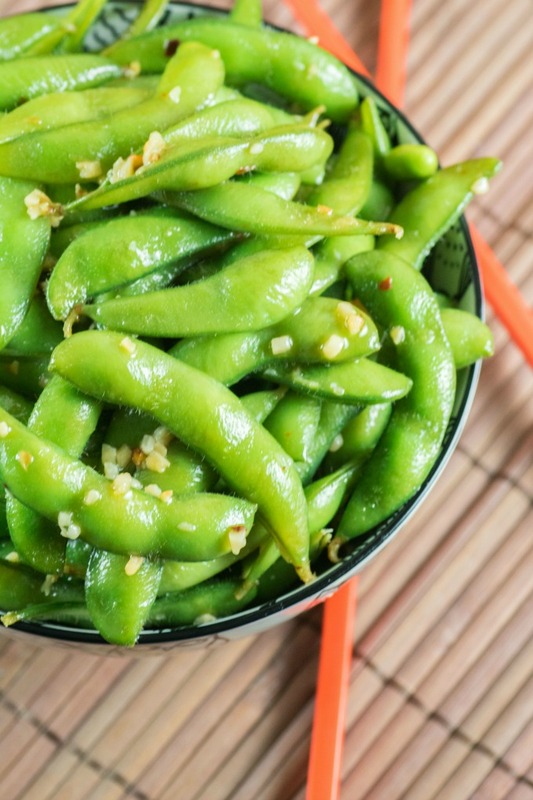 How Many Calories are in Spicy Edamame? Altough this is a very healthy snack they are not super low in calories as you might think so just be aware of that. They do pack in calories as a full pound would have 880 calories but are loaded with protein, fiber, and good carbs. So share some with friends if you have 1/4 of a pound done in this recipe they are a resonable at 220 calories. 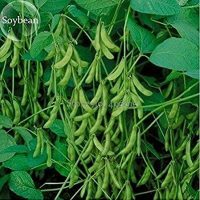 Also a lot of soy beans are GMO world wide, if that is something that you are not interested in eating then make sure you get organic soy beans. Try this recipe, enjoy them and share with friends. They would make a great game day snack too. 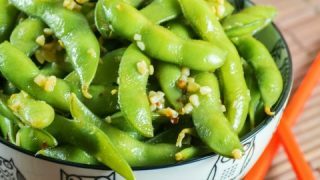 These Spicy Edamame will have you gobbling them down and loving the garlicky heat that will burst in your mouth! In a pot of salted boiling water add in the edamame and cook for 5 min. Immediately drain and plunge into ice water. Drain well and pat dry. In a large saucepan add in the olive oil and saute the garlic for 1-2 minutes. Add in the red pepper flakes and the edamame. 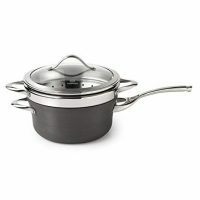 Quickly toss and heat for 1-2 min. Add the lime juice and salt to taste with the Kosher salt. Serve immediately. That sounds very tasty. I love edamame, and I eat it regularly. It’ll be nice to spice it up. I have not had edamame to often but have loved it when I did. I love this recipe and it will be a good reason to look for it where I shop. This is definitely something I need to try out to go with some lunches. They’ll be good for snacking too! My daughter recently discovered her love for edamame so I really need to buy it and cook it more! I love the addition of garlic and red pepper flakes. Yum! I have a crunch factor with my taste buds and love crunchy things. I have to try these to see if they will satisfy my cravings! I’ve never been a fan of edamame, but my wife is. But with this spice, it might be enough to make me tolerate them! My husband loves edemame. I am going to have to try to make this for him. My husband loves edamame very much. He love everything spicy also, so this recipe is so perfect for him. I am sure it will be his new favorite! Wow, this recipe of yours is so delicious and looks so easy to make. I am sure my daughter will love this. Sounds so good! I’ve never had Edamame! Can’t wait to find at my local store and try your recipe! This edamame looks so good. I can see me eating this as a snack by myself! I haven’t had edamame in so long! This looks so delicious and now I am craving it. Time to go to the store.